The Boy Scouts of America adheres to its longstanding policy of teaching its youth and adult members the safe, responsible, and intelligent handling, care, and use of firearms, airguns, and BB guns in planned, carefully managed, and supervised programs. The Northeast Illinois Council’ Shooting Sports Program is designed to allow Scouts the opportunity to learn safe firearm handling and use through the Archery and BB Gun programs designed for Cub Scouts, Webelos Scouts, and their parents; Archery, Rifle Shooting, and Shotgun Shooting Merit Badge programs for Boy Scouts; and the associated activities for the Venturing Program. One of the hallmark programs of our Ma-Ka-Ja-Wan Scout Reservation (MSR) in both East and West Camps is the Shooting Sports program, which provides a safe opportunity for Scouts on three distinct ranges: rifle and BB guns, trap shooting, and target archery. The NEIC Shooting Sports Committee is composed of trained adult leaders with extensive experience in the various shooting disciplines and their associated safety procedures. The committee oversees a roster of volunteers, many of whom are NRA or similarly certified in their field of expertise. Outside of ensuring the safety of our scouts, the Shooting Sports Committee aims to maintain and improve the Shooting Sports program offerings and facilities of the Northeast Illinois Council, and works in tandem with our Council Properties Committee and the Wilderness Engineering Society to achieve these aims. Please contact our Committee Chair below if you have interest in joining the committee or have questions about NEIC Shooting Sports programs. What precautions do you take to ensure the safety of my Scout? The Northeast Illinois Council strictly adheres to the safety procedures outlined in detail in the BSA National Guide to Safe Scouting, as well as in our Council’s Standard Operating Procedures for Shooting Sports. We take the utmost care to ensure that all shooting sports activities at any of our Council properties are well-planned, safe, age-appropriate, and staffed by trained leaders. How do Boy Scouts earn Merit Badges in the Shooting Sports disciplines? Boy Scouts in the Northeast Illinois Council can earn their Rifle, Shotgun, and Archery merit badges during resident camp at Ma-Ka-Ja-Wan Scout Reservation. 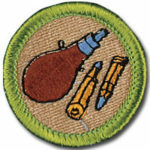 Throughout the year, there are also Merit Badge workshops for the shooting sports disciplines. You can find upcoming Merit Badge workshops on our calendar. Can Cub Scouts earn Shooting Sports Awards? The Boy Scouts of America recently developed the Cub Scouts Shooting Sports Program to deliver instruction in the shooting disciplines to younger participants. 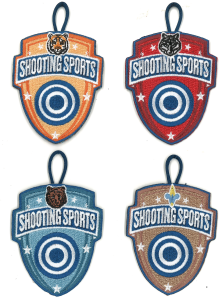 Cub Scouts can earn both rank-specific patches for completing the requirements for their respective rank as well as pins for completing specified requirements for slingshot, archery, and BB gun shooting. Cub Scouts can only shoot at Council or District run events, such as Day Camp, under the supervision of trained staff. For more information on award requirements for Cub Scouts, a detailed guide is available here.